The brain is a complex organ. (END) Technicians know how to administer and read tests to better examine a patient’s brain function. 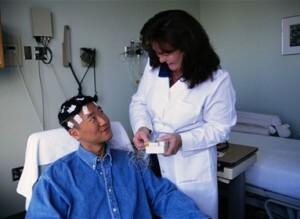 They typically work in hospital neurology departments, testing for everything from sleep disorders to brain tumors. With such a wide range of clientele, some END technicians specialize in a particular demographic, such as children or sleep patients. High school students looking to pursue a career as an END technician should keep up on their science studies, classes like Psychology, Biology, and Anatomy will make a good foundation for further learning. The American Board of Registration of Electroencephalographic and Evoked Potential Technologists (ABRET) provides the necessary recognition of “Registered END Technologist”, after the successful passage of a regulated exam. The Bureau of Labor Statistics predicts an increase of 21% or more in END Technician employment between the years 2010 and 2020. The median yearly salary for an END Technician is $41,000.